With the new Facebook News Feed, not having an image associated with your post means not being seen. Not being seen, means not being clicked on, and not being clicked on means EdgeRank will make it so few eyes other than your own ever experience the content you post to your organization’s Facebook page. 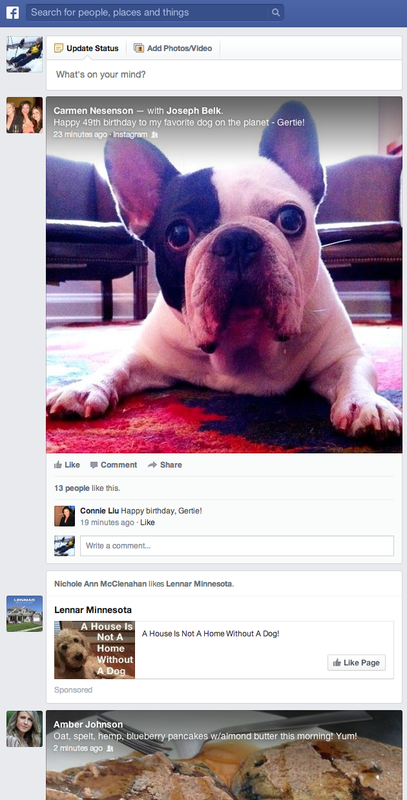 The new Facebook News Feed puts a major emphasis on visual content. When blogging, include a picture – For the sake of your blog you should be doing this anyway, but it’s especially important with Facebook. For every blog post you type, include an image that’s relevant to the post. Why? When you post a link to Facebook, Facebook will search that link for images it can place as a thumbnail in the News Feed. If Facebook doesn’t find an image, then your post appears in News Feeds with only a link (if at all). At best, this creates a bland post that looks about as interesting as a status update about a person’s choice of food for lunch. Worst case scenario, the post gets discarded by EdgeRank and is never heard from again. This is true of all content – whether a blog post, web page, or otherwise – include relevant, attractive images in whatever it is you produce. Use your phone’s camera! – Where ever you are, if you see something that’s even marginally interesting and in any way related to your organization’s mission, take a picture of it. Thanks to smart phones, we now have a camera attached to our person at all times. Use those increasingly high-quality camera phones to capture images that can be added to posts or simply uploaded to your timeline. You can always delete a photo if you don’t like it, but you can’t create one if you never snapped the picture in the first place. Communicate this message across your staff – if they see something cool happening, and it’s even remotely related to your organization’s mission, take a picture of it! Then decide later if it qualifies as good content. The point is, you need more image-driven content and nearly all of us are capable of producing that content with the phones we carry in our pockets. Provide basic photography training if resources allow, but bottom line is – help everyone who cares about your mission understand that they can all be valuable content producers, regardless of their other roles. Share photos from other users and organizations – Don’t put all the content pressure on your team. Use the image-driven content your fans, followers, and other organizations are posting by sharing that content on your Facebook page. First things first – ALWAYS GIVE CREDIT WHEN SHARING. Now that we have that established, make sharing a common content generation practice. If you see someone in your personal networks post something that works for your organization, ask them to post it to your org’s wall. If another nonprofit posts something you think your community might appreciate, click the “share” button and add it to your wall. If you see something on Instagram, ask the user if they’d be OK with you sharing it from your org’s Facebook page. Not only does this approach give you more content, but it will help strengthen your relationship with that follower. Asking to use their photo is a an enormous pat on the back and point of pride for many online and social media users. So you’re sharing great content with your Facebook fans AND strengthening a relationship with the original producer of the content. Win-win! Justin Ware is a fundraising consultant who specializes in online and social media engagement at Bentz Whaley Flessner. To contact Justin, click here. This entry was tagged advice, bentz whaley flessner, bwf, charity, content, facebook, fundraising, images, justin ware, news feed, nonprofit, online, philanthropy, pictures, tips, visual. Bookmark the permalink.